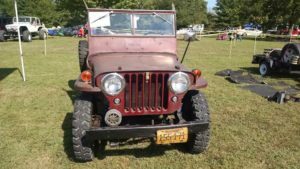 The Small Town Jeep Club held its 2017 Aaron Thompson Memorial Jeep Show in a park just east of our home town of Columbus, Indiana. 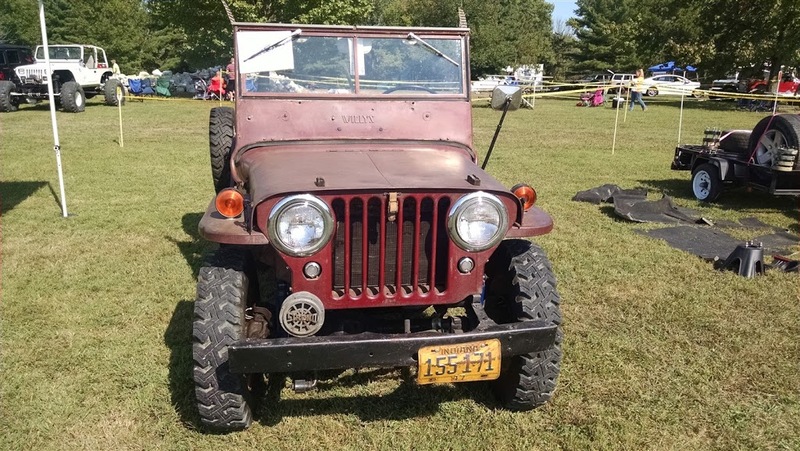 The event featured a couple of hundred jeeps of all ages and we took the Farm Jeep to add to the fun. We did have fun, but the real excitement began when we were parked next to a beautiful red 1947 CJ2a. 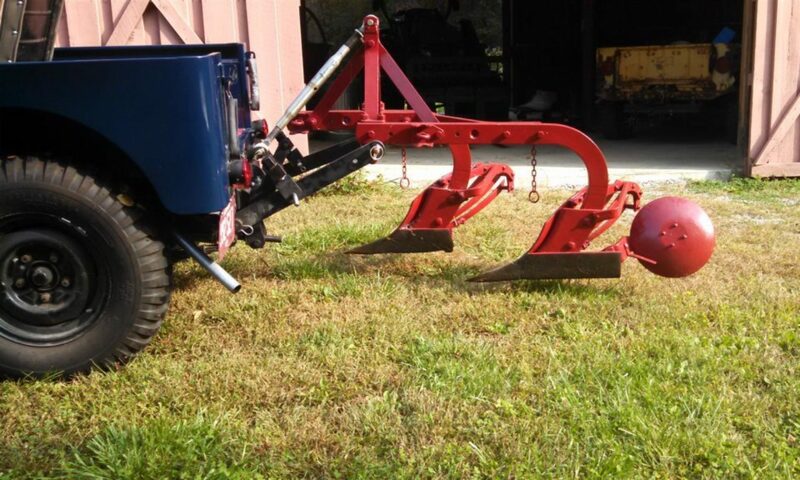 The jeep in its original red paint had been found in a Columbus garage. The lucky owner got the jeep, which had been sitting for a couple of decades, running with minimal effort. Air in the tires, fresh fuel and a new battery were all that was required to get it rolling. While the owner doesn’t have a lot of history, the 2a does provide some clues. Barely visible on the lower windshield frame are the remains of a sign that ended with GARAGE. 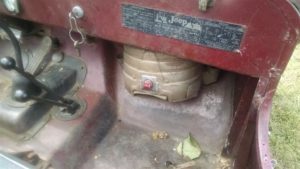 As we walked around the well preserved jeep we spotted an unusual heater located on the passenger side. The knob read “ARVIN” and the owner confirmed that the heater works well. Columbus was home to the company that became Arvin Industries from 1919 until the year 2000 . The complete story is at Preserving Arvin. It is more personal at Farm Jeep, since Barry’s father worked at Arvin. Barry also worked at Arvin in the summers when attending Purdue University. So this was a fun discovery. 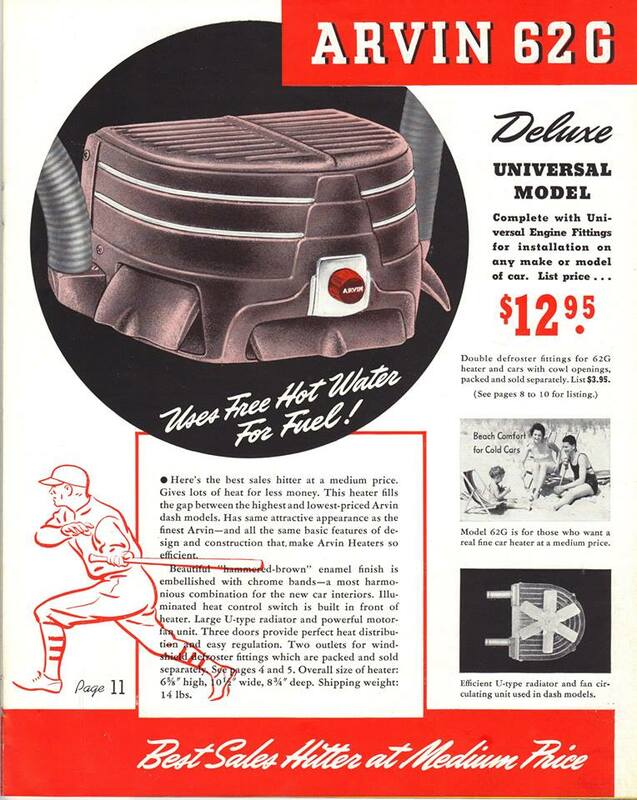 While we didn’t examine the heater we are guessing it is the Universal model pictured in a 1941 catalog. While Arvin had models for specific vehicles, the jeep wasn’t around then. According to the Preserving Arvin site, the company did produce a number of parts for jeeps and other military vehicles during WWII. Maybe we can find other Arvin products are a part of jeep history. Next PostNext Love is everywhere….